We have the Esquire Network launch schedule for you today. The network currently known as G4 (owned by NBC Universal), will re-brand and re-launch as Esquire Network next week (April 22), as we mentioned. 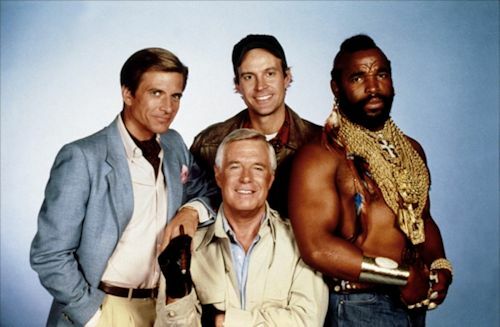 The network will start the new schedule at 12 noon ET on Monday, April 22 with The A-Team starring Mr. T! The '80s action drama will air as a block to launch the network from 12-6pm (and will air every Monday after that from 1-5pm). A special airing of the Will Ferrell movie Semi-Pro will follow at 6pm leading into the Parks & Recreation block from 8-10pm. Parks & Recreation will air every Monday from 8-10pm leading into the short-lived comedy Party Down from 10-11pm. Both comedies will encore the next afternoon, on Tuesdays from 3-6pm with Party Down starting it off this time. In primetime on Tuesdays, original series Knife Life and The Getaway will air from 9-11pm. On Wednesday, April 24, more acquisitions will launch. First up, '80s Tom Selleck drama Magnum P.I. will air every Wednesday from 1pm-5pm (but on this day it will be longer from 12-5pm). Magnum also will still air on the NBC-owned mutlticast digital station Cozi TV. The Tom Selleck drama will lead into reruns of USA Network series Burn Notice at 5pm & 6pm. The series will air weekdays at 5pm & 6pm (and an encore at 11pm & 12am in late night). Also launching April 24, are a week later airings of Late Night with Jimmy Fallon at 7pm, as we mentioned. It will also air weekdays and air at 7pm with a next day encore at 12 noon. Movies will air in primetime on Wednesdays, with Shutter Island airing on April 24. As mentioned Burn Notice will air in late night at 11pm & 12am, leading into another off-network buy with the '90s drama New York Undercover. That series will air weeknights at 1am. It will also continue to air on Centric, so this is a shared deal between Esquire and Centric. On Thursdays, Parks & Recreation will encore two of its Monday airings and air 1-2pm and again from 8-9pm, as it will be good promotion for its first-run NBC airings at 9:30pm. The Wednesday primetime movie will encore on Thursday afternoons leading into Burn Notice and Fallon. In primetime on Thursdays, as mentioned Parks will air 8-9pm leading into encores The Getaway and Knife Life from 9-11pm. On to Fridays, we have another classic '80s drama airing from 1-5pm, this time it is Airwolf! In primetime, reruns of USA Network series Psych will air Fridays from 8-11pm. Mornings (9:30am-12am) and late nights (2am-4:30am) will continue to be Cops every weekday, as it was on G4. On to weekends, we have a lot of encores and movies. Of note, Parks & Recreation will encore its Monday airings once again, this time Sundays 7-9pm leading into encore of Party Down from 9-10pm. Anyway, it's good to see The A-Team, Magnum P.I. and Airwolf join this network. Hopefully we see more classic '80s series join the line-up. As of now Knight Rider and Quantum Leap will not be on Esquire, as they have been airing on G4. Stay with us for continued updates on Esquire Network and for any scheduling updates. Up next, TVGN announced that it will become the exclusive basic cable home for the #1 daytime soap, The Young & The Restless (Y&R). The acquisition of the top-rated daytime franchise from Sony Pictures Television marks the first TVGN programming announcement as part of the new CBS Corporation/Lionsgate partnership. Beginning this summer, Y&R will move from SOAPnet, where it has already been a basic cable ratings success, to TVGN, keeping the 7:00 PM, ET/PT time slot where it has built a loyal fan base, and will appear day-and-date with its broadcast on the CBS Television Network. One of the most popular franchises in daytime television history, Y&R recently celebrated 40 years on the air on CBS, where it has dominated the ratings in daytime. TVGN recently announced that is has changed its name from TV Guide Network to just TVGN. Currently, the TVGN line-up consists of reruns from 9am-8pm will series like Ugly Betty, Cybill, Designing Women, Early Edition and Who's the Boss? It is unclear what will happen now that CBS has partnered with Lionsgate to buy the network. There is speculation that same-day reruns of Entertainment Tonight, OMG! Insider and Inside Edition could pop-up on the network. Or perhaps CBS will also delve into the CBS Paramount library and air reruns of classic sitcoms from their library. It's too early to tell, but we will keep you up to date...for now you can still continue to enjoy the current slate of sitcoms/dramas. Stay with us.